For 2018, you can contribute $5,500 ($6,500 if you're age 50 or older) to an IRA. Contributions to a traditional IRA are tax-deferred, meaning that you won't pay income tax until you withdraw the money. There are contribution limits, and you'll need to make the contribution by the due date of your tax return. There are two types of IRAs: traditional and Roth IRA. Unlike a traditional IRA that uses pretax dollars, Roth IRA contributions are made with after-tax dollars so you won't have to pay taxes on this money when you withdraw it. You can make regular contributions to a traditional IRA up to age 70 1/2 provided you have earned income. If you're 50 or older, you can make catch-up contributions of up $6,500 for 2018. Roth IRAs have no age restrictions. For IRA purposes only, earned income consists of wages reported on a W-2, self-employment income from a business or farm, and alimony. "To contribute to a traditional IRA, you must be under age 70 1/2 at the end of the tax year. You, and/or your spouse if you file a joint return, must have taxable compensation, such as wages, salaries, commissions, tips, bonuses, or net income from self-employment. Taxable alimony and separate maintenance payments received by an individual are treated as compensation for IRA purposes. Compensation doesn't include earnings and profits from property, such as rental income, interest and dividend income, or any amount received as pension or annuity income, or as deferred compensation." You can contribute funds to your traditional IRA at any time during the calendar year, and you can also make contributions to an IRA by the first deadline for your tax return, not counting any extensions you might take. IRA contributions for tax year 2018 are due by April 15, 2019. Report your tax-deductible IRA contribution directly on the first page of Form 1040 or Form 1040A. You don't have to itemize to claim this deduction. It's an adjustment to income, so you can take it in addition to itemizing or claiming the standard deduction for your filing status. Contributions to a traditional IRA might be fully deductible, partially deductible, or entirely nondeductible, depending on whether you and/or your spouse are covered by a retirement plan through your employer. 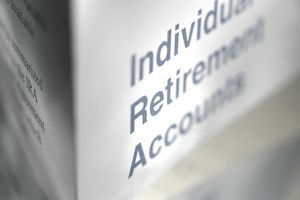 If a taxpayer is covered by a retirement plan at work, his income determines whether his IRA deduction will be limited. Retirement plans at work include 401(k) plans, 403(b) plans, and pensions. You can contribute to a traditional IRA whether you participate in another retirement plan through your employer or business or not. However, you might not be able to deduct all of your traditional IRA contributions if you or your spouse participates in another retirement plan at work. If you are married and your spouse is covered by a retirement plan at work and you aren’t, and you live with your spouse or file a joint return, your deduction is phased out if your modified AGI is more than $189,000 but less than $199,000. If your modified AGI is $199,000 or more, you can’t take a deduction for contributions to a traditional IRA. To calculate your AGI, use the modified adjusted gross income formula. Use Worksheet 1-1 in Publication 590-A, Contributions to Individual Retirement Arrangements, available in pdf format on the IRS website, to calculate your modified AGI. Once you determine your modified AGI, use the chart below to figure out if your IRA deduction might be limited. Is your modified AGI less than the "from" amount? In between these amounts? More than the "to" amount? Can You Get a Tax Deduction for Making an IRA Contribution?